In nature, microbes do not exist in isolation but co-exist in a variety of ecological and biological environments and on various host organisms. Due to their close proximity, these microbes interact among themselves, and also with the hosts in both positive and negative manners. Moreover, these interactions may modulate dynamically upon external stimulus as well as internal community changes. This demands systematic techniques such as mathematical modeling to understand the intrinsic community behavior. Here, we reviewed various approaches for metabolic modeling of microbial communities. If detailed species-specific information is available, segregated models of individual organisms can be constructed and connected via metabolite exchanges; otherwise, the community may be represented as a lumped network of metabolic reactions. The constructed models can then be simulated to help fill knowledge gaps, and generate testable hypotheses for designing new experiments. More importantly, such community models have been developed to study microbial interactions in various niches such as host microbiome, biogeochemical and bioremediation, waste water treatment and synthetic consortia. As such, the metabolic modeling efforts have allowed us to gain new insights into the natural and synthetic microbial communities, and design interventions to achieve specific goals. Finally, potential directions for future development in metabolic modeling of microbial communities were also discussed. Keywords: Microbial communities, Metabolism, Community modeling, Genome-scale metabolic models, Flux balance analysis, Kinetic models. Keywords:Microbial communities, Metabolism, Community modeling, Genome-scale metabolic models, Flux balance analysis, Kinetic models. Abstract:In nature, microbes do not exist in isolation but co-exist in a variety of ecological and biological environments and on various host organisms. Due to their close proximity, these microbes interact among themselves, and also with the hosts in both positive and negative manners. Moreover, these interactions may modulate dynamically upon external stimulus as well as internal community changes. This demands systematic techniques such as mathematical modeling to understand the intrinsic community behavior. Here, we reviewed various approaches for metabolic modeling of microbial communities. If detailed species-specific information is available, segregated models of individual organisms can be constructed and connected via metabolite exchanges; otherwise, the community may be represented as a lumped network of metabolic reactions. The constructed models can then be simulated to help fill knowledge gaps, and generate testable hypotheses for designing new experiments. More importantly, such community models have been developed to study microbial interactions in various niches such as host microbiome, biogeochemical and bioremediation, waste water treatment and synthetic consortia. 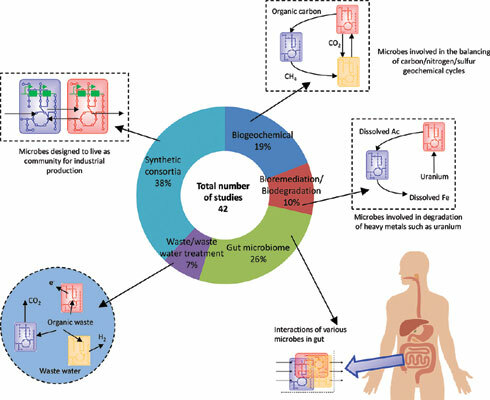 As such, the metabolic modeling efforts have allowed us to gain new insights into the natural and synthetic microbial communities, and design interventions to achieve specific goals. Finally, potential directions for future development in metabolic modeling of microbial communities were also discussed.